When we were in Istanbul back in April, you may remember we got to stay in a very swanky apartment overlooking the Bosphorus; an apartment where we felt like we were living in the neighbourhood of Galata for a few days. 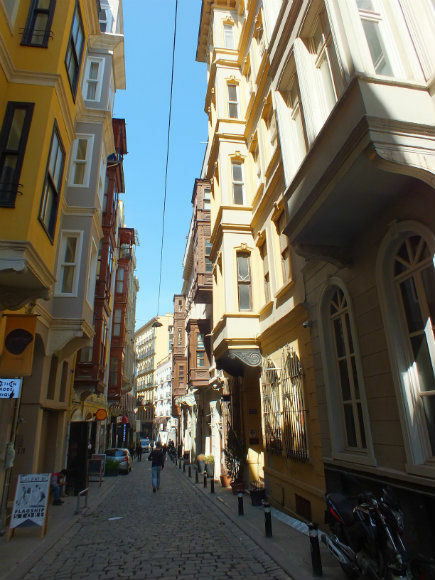 We also looked around some of the other Istanbul Place Apartments and said we would definitely stay there again…in one of their places that more suited our little budget, of course. Well, testament to them and the great job they do – when we went to Istanbul in November for the Eurasia Marathon, because we only ever book our trips last minute, by the time we got in touch with them to ask about availability, there was no room at the inn. And that’s how, when we went to Istanbul to take part in the 10k and the 15k in the Eurasia Marathon, me and Barry came to be staying in perhaps the poshest hotel we’ve stayed in: Hotel Nena in Sultanahmet. On finding our first choice of apartments in Galata to be full, we decided it would be much more practical to stay in the main tourist area of Sultanahmet: there were a couple of places we wanted to revisit after some years, we know our way around the city so coming and going would be easy enough, the shuttle buses to the Eurasia run start lines leave from Sultanahmet…and there’s loads of accommodation choice in the area. So we started to browse our Sultanahmet hotels page for some ideas, thinking we would just grab a budget en-suite room in a hostel. But no! Just like the deal we found with Mangana Konak Suites a couple of years ago, a list of hotels popped up within our budget…hotels we would never have considered. Hotel Nena in Sultanahmet more than looked the part with its rooftop dining area, and, within minutes, an economy room was booked. So there we were, at the doors to the hotel; backpacks, laptops and a couple of other bags strapped around us. We’d had a 13 hour overnight bus journey from Fethiye and then the metro from Esenler otogar. We knew from the map that Hotel Nena was just down a side street off the main Divan Yolu Caddesi, between the Sultanahmet and Çemberlitaş tram stops. A little knowledge helps a lot in situations like this and we’d already planned to jump off the tram at Çemberlitaş…because we knew we’d be walking downhill in search of our digs. See, we do use our brains sometimes. Anyway, within five minutes, we were at the doorway of Hotel Nena, looking a tad dishevelled from our journey and tittering to ourselves at the same time at the sight of the ground floor reception area and garden room. Barry and Julia don’t stay in places like this. We’d arrived way before check-in time and the room wasn’t ready but, “would you like to leave your bags in the luggage room for now, how would you like to pay, you can pay when you leave, you do know it’s an economy room don’t you (the hotel had already sent us two emails regarding this and we’d replied assuring them we just wanted a bed, a shower and a good breakfast and their hotel looked just great for all of that), yes you can pay in lira.” And they gave us a very good exchange rate of the day, too. There’s a rarity. You just can’t beat a grand old building, can you? And, by the time we’d eaten that, it was time to go and check out our Hotel Nena economy room. The rooms at Hotel Nena are separated into different standards – and all of them, as far as we’re concerned, are rather grand. Obviously, the economy room sits right at the bottom of this little hierarchy; these are the smallest rooms and the view from the window is of the vent shaft. This was what the hotel had emailed us about, at such pains to make us aware of this. But, like we said, we knew that when we made the booking; we wanted a comfy, clean bed; we needed a good shower for after our run – oh, and we love our breakfasts, too. A swanky hotel had better have a swanky breakfast! So what did we get for our cash in our economy room at Hotel Nena? Well, we got a kingsize bed with crispy cotton sheets and duvet, we got a double wardrobe complete with coat hangers, shelves and a safe, a bedside cabinet, TV, fridge and minibar, complementary tea, coffee and bottled water and a dressing table and stool. The bathroom also had the bonus of a mini bath with built-in seating – perfect for a foot soak after a run – as well as a powerful shower with hot water all day. No complaints from us! The beauty of Sultanahmet is, you are never too far away from classic views of both world famous architecture and also Bosphorus scenes. 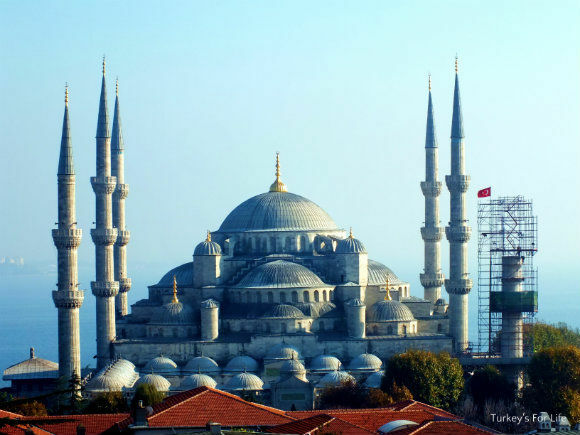 We’d read in the description of Hotel Nena that they had a fabulous rooftop dining terrace with views of Sultanahmet Camii (the Blue Mosque), Aya Sofya (Hagia Sophia) and Topkapı Museum with Hagia Irene in its grounds. These views also stretched down the Bosphorus Strait to the Bosphorus Bridge and Ortaköy. Perfect! Well, the sun was kind of shining, so, despite the fact that most of the hotel guests were breakfasting inside, in the warmth…hmm, it just felt a bit of a waste not to sit outside and soak up these amazing views of the city. Of course, lucky us, as ever. One of the rare occasions we’re given the opportunity to view the Blue Mosque from up high, with all six minarets on show…and one of them is under restoration. Story of the travels of Barry and Julia – scaffolding! Ah, well; still special, all the same. So the views are there for breakfast. Now what about this actual breakfast? Does swanky hotel = swanky breakfast? At Hotel Nena, it certainly does! 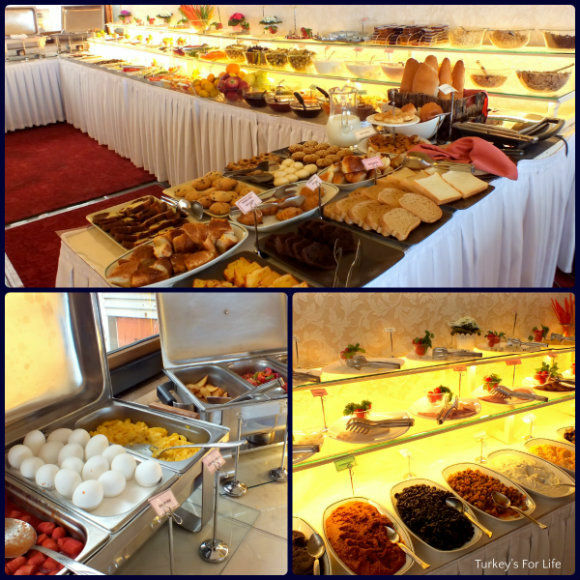 We do get excited with Turkish breakfast buffets, and, as hotel breakfasts go, we both agreed this one was the best by far that we’d had in Istanbul. We didn’t know where to start – so we started at the beginning, stopped when the plate was full, ate it and then went back to continue from where we’d left off. Each day had variations of hot foods – boiled eggs, scrambled eggs, menemen, börek, cocktail sausages in a tomato sauce, roast potatoes. After that, there were the staples – numerous cheeses, lots of different olives, cucumbers, tomatoes, salamis and other cold meats, yoghurt, homemade jams and honey, bread, simit, kurabiye and sponge cakes. Then there was a whole array of extra goodies: a super-spicy muhammara, black olive paste, yoghurt with grated carrot and olive oil, roasted aubergine and courgette chunks, sigara böreği. And if all that sounds just too much for breakfast, there was a range of cereals, too and lots of fresh fruits and fruit salad. Waiters and waitresses serving as much tea and coffee as we wanted, a fab breakfast spread and classic views of Istanbul. A perfect way to start any day, we’d say! And that’s it, really. 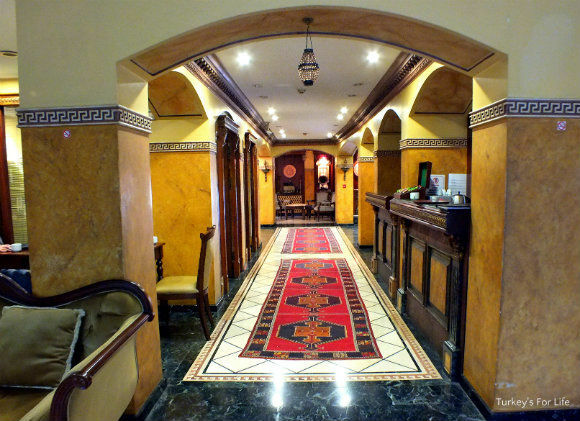 Hotel Nena, Sultanahmet suited us just fine and we’d happily go back there again. Four years ago, a double room in an Istanbul backpacker hostel cost us 50 Euros per night. Four years later, we paid £40 per night for a double room with a great breakfast in a (what we class as a) luxury hotel. If you’re pondering a trip to Istanbul and want your money to go as far as possible, well perhaps now and the coming year might be the times to go – hotels like Hotel Nena in Sultanahmet have certainly got the deals to make your stay that bit more luxurious. 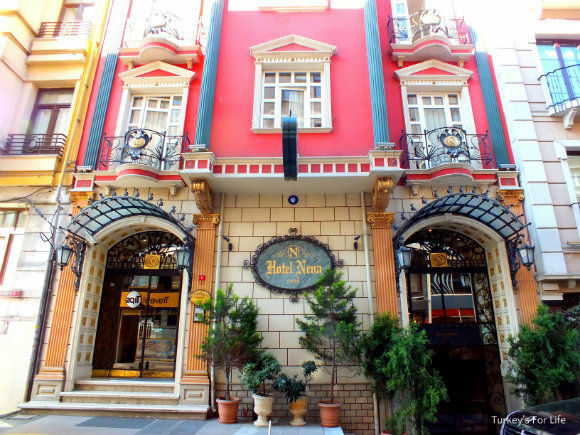 Hotel Nena is on Klodfarer Caddesi, off Divan Yolu Caddesi. The hotel is situated between Çemberlitaş and Sultanahmet tram stops, making it easy to get around the city. 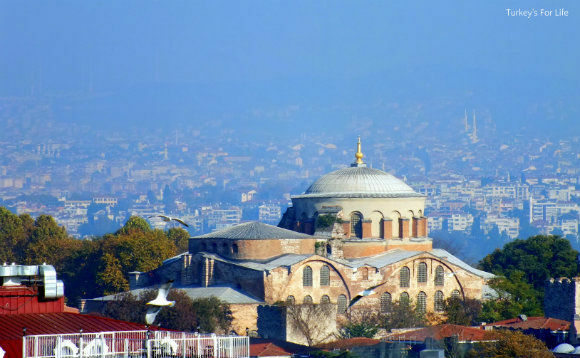 It’s also an easy walk to Beyazıt, as well as the sights of Sultanahmet. Hotel Nena has lift access to each floor. We stayed in an economy room but Hotel Nena also has standard rooms, deluxe rooms, triple rooms and a family room. 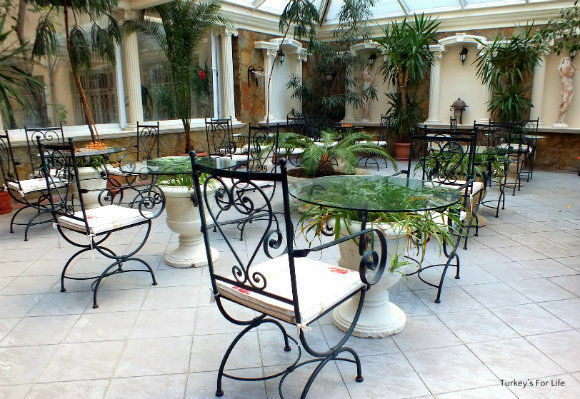 Hotel Nena is bed and breakfast but the roof terrace also serves as a restaurant for evening meals, too. You can snap up a room at Hotel Nena through Booking.com. Perfect timing! 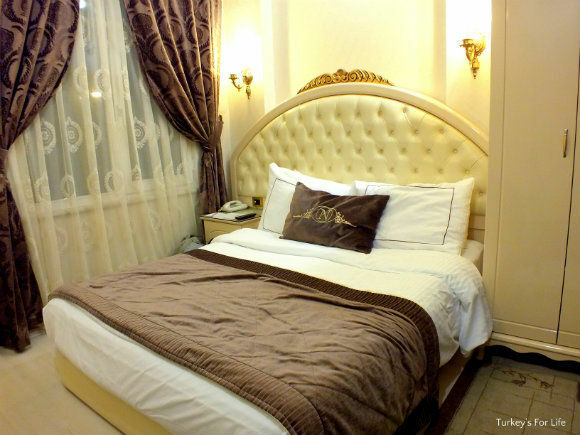 I’m headed to Istanbul on Monday, and needed a hotel, so just booked this through your booking.com link! Thanks for the recommendation, saved me a ton of time. SO excited for the rooftop view and the location sounds fabulous! Ohh, thanks a lot a for booking via the link, Laurel. Much appreciated. 🙂 Hope you like Hotel Nena as much as we did – and enjoy Istanbul, too. We’re already looking forward to going back again.